When visiting Monda, there’s one destination that you simply have to go to, and that is “El Camino del Rey” (or the Kings Path) which is located just 1 hour from the hotel. The amazing walkway was originally built for workers of the hydroelectric power plant at the “Chorro Falls” back in 1905. 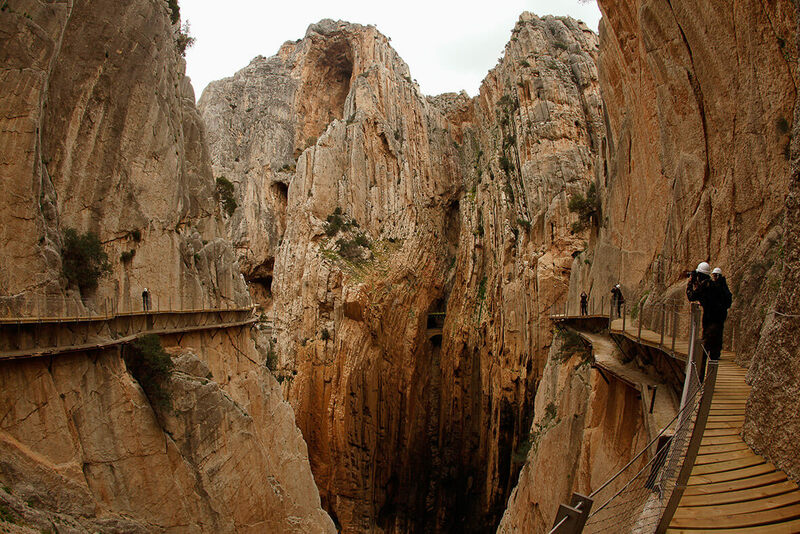 When the King Alfonso XIII crossed the path in 1921 it became known as “el Caminito del Rey”. Nowadays it is a huge tourist attraction due to its beautiful views. The walkways give a stunning birds eye view over the “El Chorro Lakes” which are an attraction on its own! Mind you, this amazing adventure is not for the faint hearted! 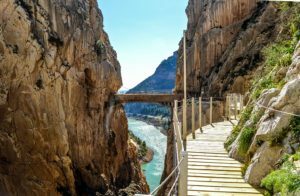 Even though the government of Andalucia has recently completed woks to make the “Camino del rey” safer and more accessible for the general public, you are still walking on paths around 100 meters high and sometimes just 1 meter wide! The new pathway was finished in 2015 and was constructed directly above the original walkway which had deteriorated over the many years of usage by avid climbers. 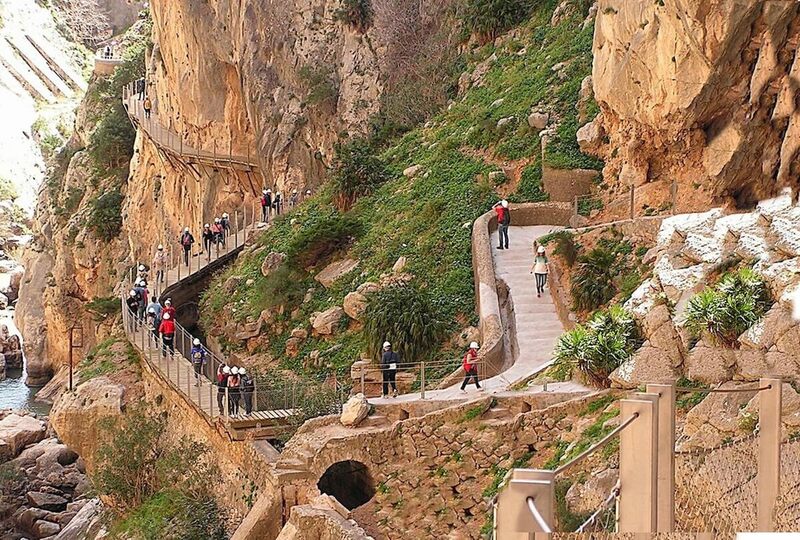 Now the walkway isn’t just for adventurous climbers, anyone can enjoy the ancient walkway. The only thing you need to leave home is your fear of heights! 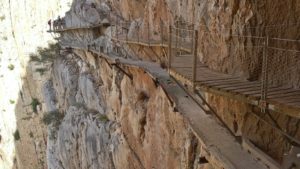 The camino del Rey offers a general tour (without guide) and a guided tour. Either tour starts on the south side of the walkway and ends on the north side so you might need to take a bus to bring you back to your car. 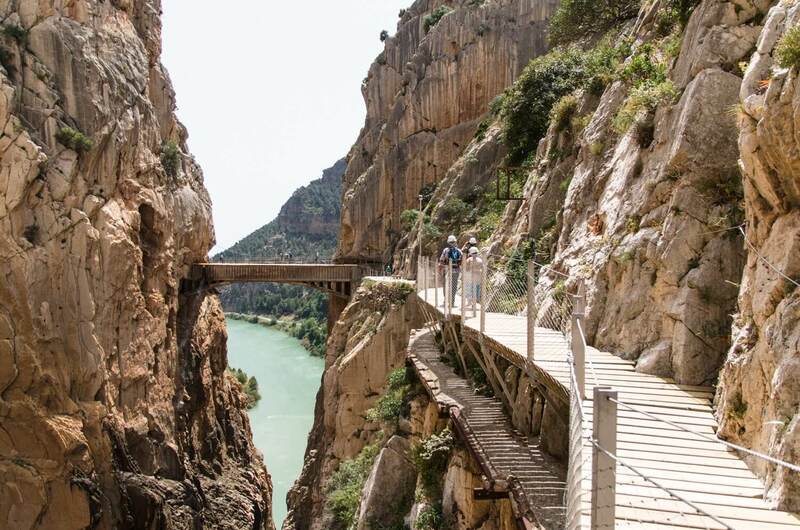 If you are interested to take on the “Caminito del Rey” then make sure you make a reservation before you head off. The walkway is very popular, especially in the high season, so there are limited tickets available every day. 24, 25 & 31 December + 1 January, the attraction is closed to the public. In winter the walkways are open from 9:30 to 15:00 every day except Mondays. TIP: the best times to book are at 12:00 in the winter, as you will have less queues to stand in. In summer it is advised to come as late as possible so you can enjoy the majority of your walk in the shade. Children below the age of 8 years are not permitted to take the walk. Children between the ages of 8 & 18 will be asked to proof their age and can only take the walk accompanied by an adult. 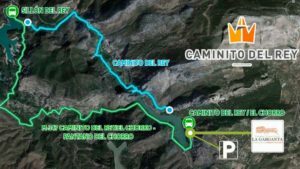 If you go around the entire route, you will walk for approx 2 to 3 hours. The length of the entire walkway is 7,7 kilometres. Since the path if just going 1 way, this means you will end in a different place than where you started. Keep this in mind as you will need to take the bus back to your car. TIP: if you park your car in the morning on the south entrance in the morning and take the bus to the north entrance to take the walk, then you will avoid long waiting times for the bus back once you have finished your walk. The walkways have recently been completely refurbished and adapted to suit the general public. You don’t have to be a sporty person to take the walk, however, there are many stairs and it is very high, so you will need to be aware of this before you take the walk. Any people that have had or still have heart problems will be advised not to take this journey. 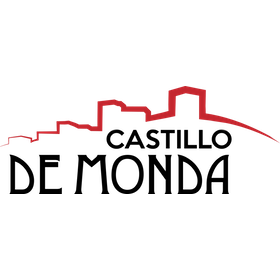 Hotel Castillo de Monda is a beautiful castle located in Monda converted into a stunning hotel. Situated just 15 minutes from Marbella Center, the hotel lends itself for weddings, corporate functions and private weekend getaways as well as relaxing holidays.